A passion for unique and ground breaking design fuels every one of our pieces. Permanent Addictions strives to make every tattoo an outward expression of the individual. Whether you bring in your own complete design or just a few ideas you would like us to bring together, you can trust our eye for detail and quality. Interested in getting a tattoo but not sure what you want? Come talk to one of the skilled tattoo artists at Permanent Addictions and work out your idea. Our tattoo artists know what questions to ask to begin sketching a design. Whether you've been a collector for many years, you have something small in mind, or you just want to come in to look around and get some ideas. The artists will meet you where you’re at, discover your interests, and then create a custom piece you’ll love for life. Permanent Addictions Tattoos offers custom tattoos with a passion for unique ground-breaking designs. We strive to make every tattoo an expression of each individual. You can either bring in your own design or have one of our outstanding artists put something together for you. Either way you will be amazed at our eye for detail and quality. Schedule an appointment or Walk-in, Your idea or ours, Our design or yours. At Permanent Addictions, we strive to give you the best tattoo experience possible. 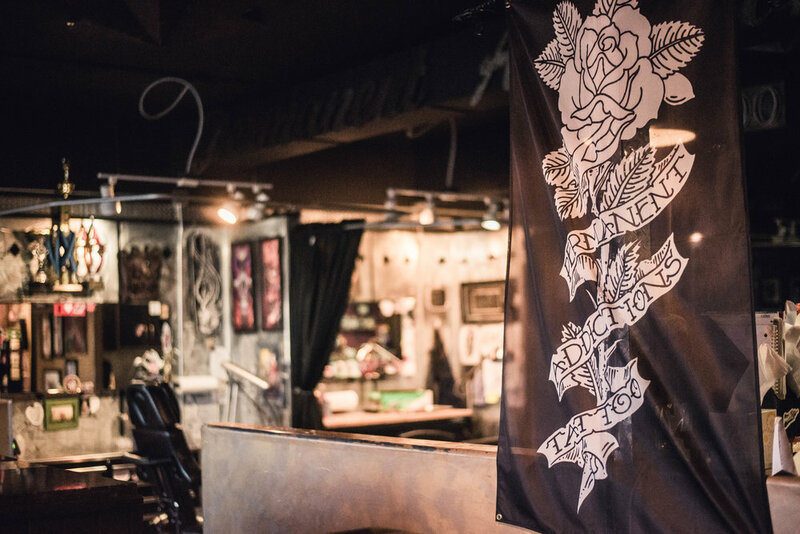 We believe that starts with providing a clean and sterile studio environment, extends to an open, friendly and inviting design process, and ends with creative and well-executed tattoos that our clients will cherish for a lifetime. We take the health and well-being of our customers (and ourselves) very seriously, and that means we have strict protocols concerning our equipment and studio setup. We are annually inspected by the health department, use single use needles, and have a modern, separated clean room where all of our instruments are sterilized using an autoclave that is tested monthly. We are here to serve you, and want you to feel comfortable communicating your ideas to us, whether simple or complicated. With more than 50 years of tattooing experience between us, our team is committed to providing design that will not only suit your desires, but also fit your body. Have questions? Please contact us! We’ll be happy to answer any and all questions you may have, about the studio, about design, and about the tattoo process itself.